We’ve really been enjoying the company of new friends that we meet on our journey and one of the best ways to get to know them is to introduce them to some of our favorite games which we’ve brought along with us. Follow the links to get your own on amazon which will help us continue our journey as well. 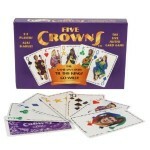 5 Crowns is a highly entertaining card game that uses a customized deck containing the four standard suits, plus a new one. It’s a bit like Gin, and a bit like Rummy, but adds a competitive element that’s hard to resist. Each player begins with a 3 card hand and attempts to put together a “hand” of 3 like cards or a straight with 3’s and jokers being wild. You continue to 4 card hands, then 5, all the way up to a massive 13 card hand with Kings going wild. It’s been a hit with all the travelers we’ve met along the way, and we know you’ll enjoy it too. Eat brains. Don’t get shotgunned. You are a zombie. You want brains. More brains than any of your zombie buddies. Zombie Dice is a quick and easy game for gamers and non-gamers alike. The 13 custom dice represent victims. Push your luck to eat their brains, but stop rolling before the shotgun blasts end your turn! 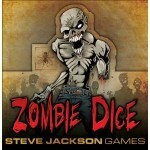 Zombie Dice is a dice game for 3 to 8 players. Each game takes 10 to 20 minutes, and can be taught in a single round. This game is an absolute blast and makes a GREAT drinking game while on the road. It’s small and easy to pack making it an ideal travel game. 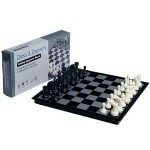 What more could be said about chess and checkers? A small magnetic set is easily to carry around and has mass appeal among world travelers. Instead of the traditional drinking game which only tests your tolerance in losing brain cells put your wits to the challenge! 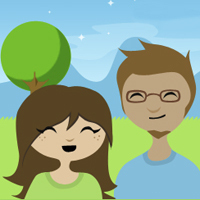 If anybody else has any suggestions for great travel games please let us know! Also, don’t forget your playing cards and extra dice!